An estimated 70 percent of Americans will experience impostor syndrome at some point in their lives, according to a paper published by the International Journal of Behavioral Science. The paper stated those afflicted by the “Impostor Phenomenon” feel their achievements are undeserved and that they are frauds pretending to be knowledgeable in their fields. 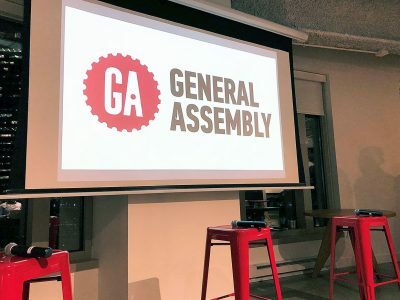 General Assembly, an education center for career development, hosted a panel at its Financial District location Wednesday evening. The talk, titled “Overcome Your Imposter Syndrome,” addressed the external forces, challenges and solutions associated with the phenomenon. Scott Stolze, a leadership speaker who moderated the discussion, invited the crowd to participate in the conversation with the panelists, and some participants shared previous experiences with impostor syndrome they had when transitioning jobs. After panelists Kit Pang, founder of BostonSpeaks, an organization that assists individuals with communication and speech, Christie Lindor, a consultant and author, and Shayna McDonough, founder of her self-titled career coaching business ShaynaLee Coaching, gathered onto stools, Lindor described impostor syndrome as a feeling that each individual defines for his or herself. The three discussed the unavoidable role outside forces played. Existing societal constructs, expectations and confidence levels were called to attention by Pang and Lindor. Lindor said that identifying problems was key to gaining self-knowledge and coping with the phenomenon and that she individually does this by asking herself specific questions. “What are the baby steps and habits I need to take to get where I need to go?” Lindor questioned. Last year, Lindor, a self-proclaimed introvert, said she ventured out of her comfort zone by leading discussion-based consulting events at the Boston Public Library. After doing so, she said she presented her very own TED Talk. Lindor then called the GA audience to attempt everything they find scary to help them leave their comfort zones and gain confidence in their abilities. When Lindor was lacking confidence, she said she reinvented herself and reminded herself that everyone starts somewhere. She said she discovered she had to recognize the insignificance in comparing herself to other successful people. McDonough expanded on Lindor’s advice by outlining feelings of inadequacy, especially in women. She said she personally understands circumstances where impostor syndrome becomes paralyzing. In an interview after the panel, McDonough added that there was a key difference between impostor syndrome and self-doubt. Through first-hand observation, McDonough considered the phenomena of individuals measuring themselves to pre-existing success. She challenged the crowd to define success and self-worth using other means than by what others have accomplished. To McDonough, the feeling of being less-than is tied with overachievement. McDonough emphasized the importance of a positive attitude in overcoming an impostor syndrome mindset. Based on her experiences from her career, she said she can “attack” the challenge posed if she can learn the proper skills. She questioned whether the potential problem is a hard skill deficit or rather the lacking of a soft-skill. During the panel, Pang said people run into the danger of overthinking if they get in their heads. He elaborated on this idea, calling for the process of trial and error. “Know when to listen and know when to ask questions,” Pang advised the audience. Julia Scott, a junior in the Sargent College of Health and Rehabilitation Sciences who attended the talk, related this to her academic career at the college.